Purchased at an estate sale, this small white painted metal stand is in great condition. 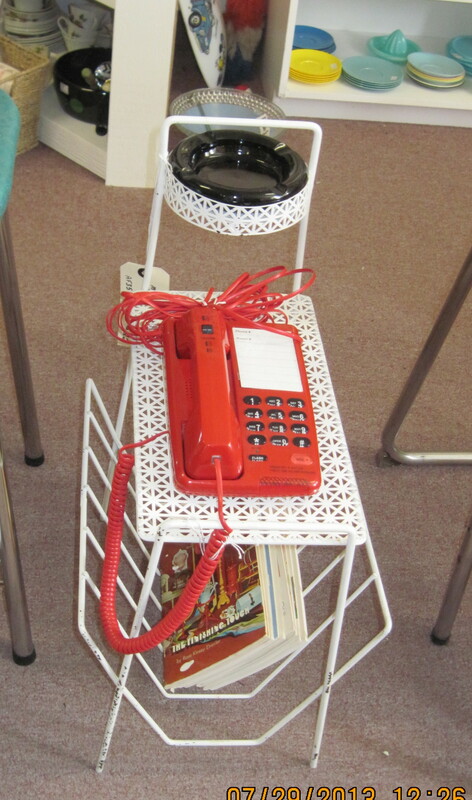 It is a multi purpose stand: Ashtray holder, Magazine Rack, Telephone table. 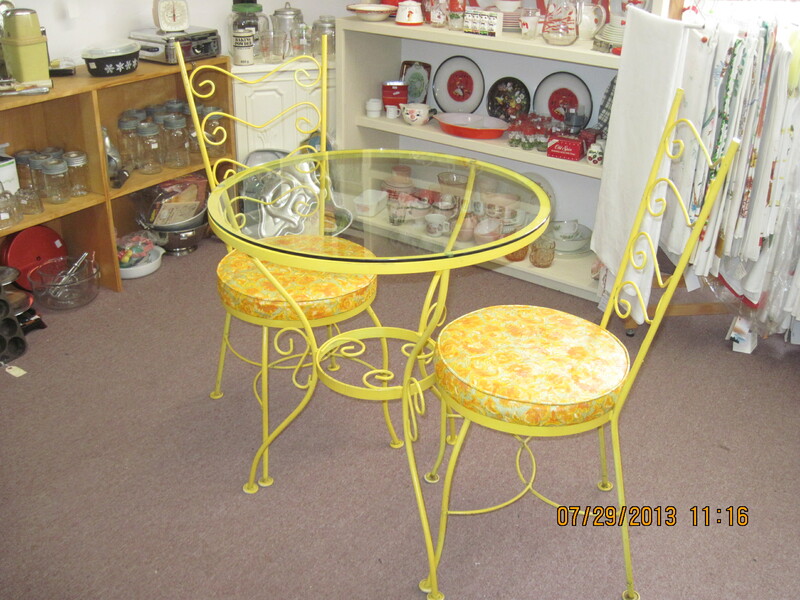 Looks great with the vintage stools. Paint shows some minor scuffing. This stand is available at my booth at 26 Mill Street, Almonte ON, at the Almonte Antiques Market. 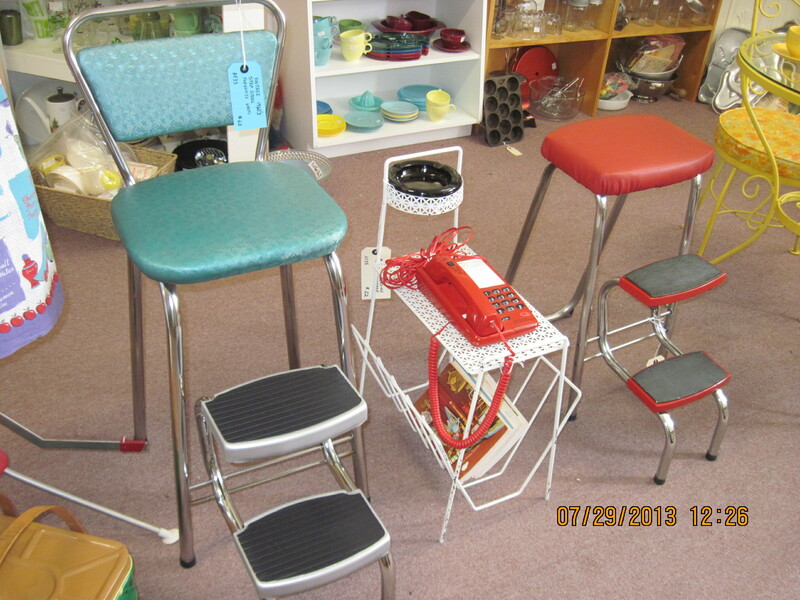 Please note: The stand and the turquoise stool, red stool and phone are now SOLD!!! Found this at an auction and was thrilled to get it. Glass topped table is in good overall condition. The set has some minor scuffing of the paint here and there. 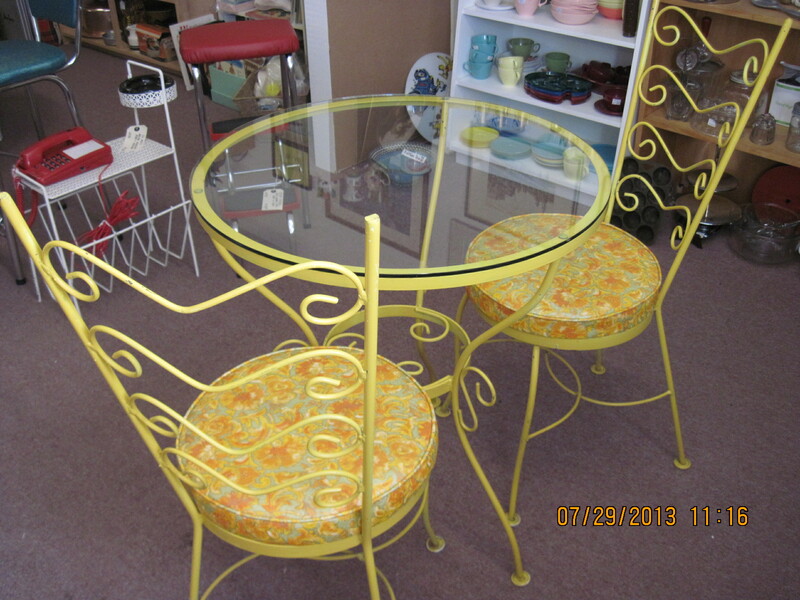 The chairs are in the original orange and yellow vinyl upholstery. One chair has a brace that is separated at the joint and could be easily repaired. The set is sturdy and comfortable. The set is on display at our booth in the Almonte Antique Market, 26 Mill Street, Almonte ON, just 30 km west of the city of Ottawa. Nice vintage 1960’s chrome step stool in good condition. Chrome is in great shape, no pitting or rust. Steps have been given a new coat of silver paint to clean them up. Vinyl in original as found condition. 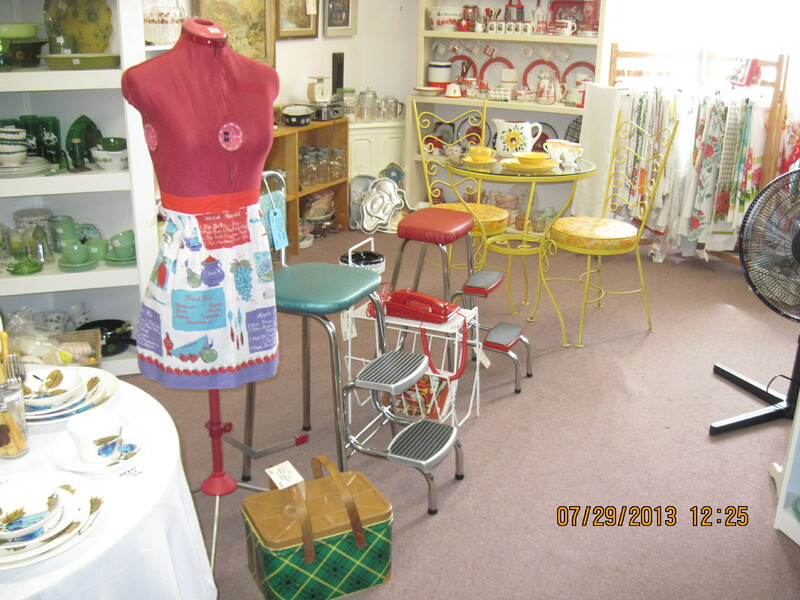 Looks great nestled among the other colourful bits and pieces from the 50’s and 60’s. For sale at my booth at the Almonte Antique Market, 26 Mill Street, Almonte ON, just 30 km west of Ottawa. 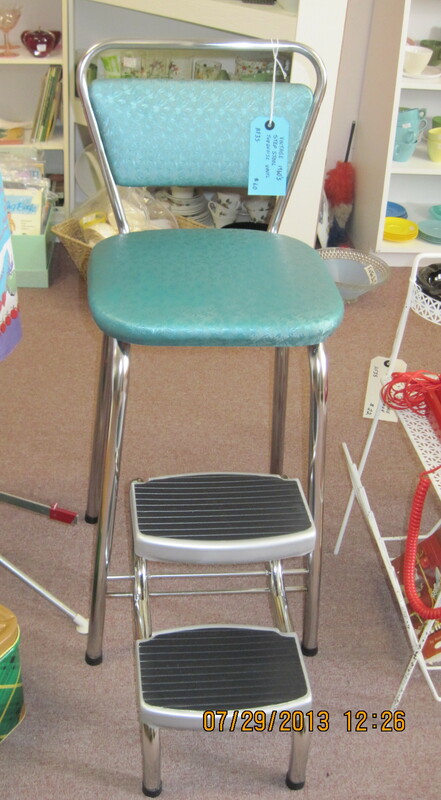 Please Note: The stool is now SOLD!!! 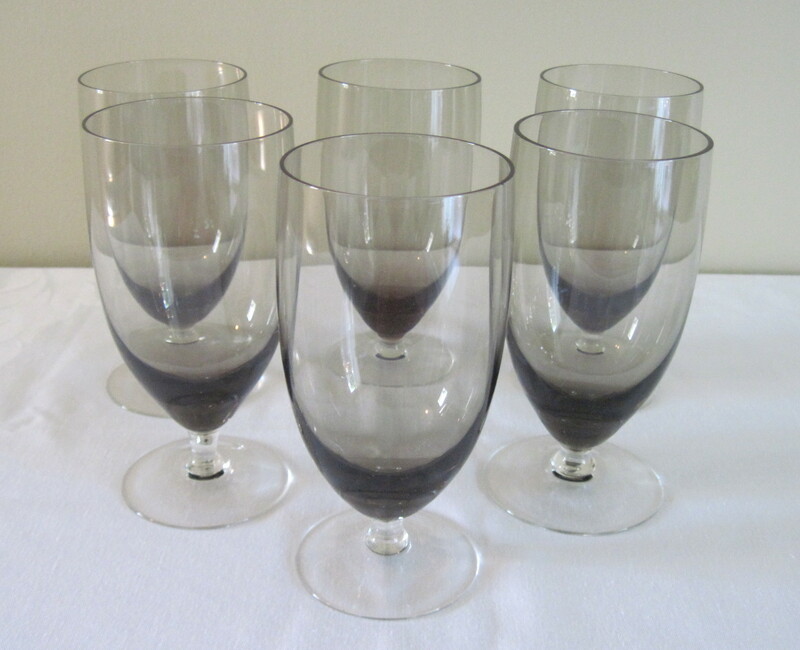 Set of 6 large smoked glass water goblets. These look mid century to me. Smoked glass was very popular back in the 60’s and 70’s. Hard to find these days. These are crystal and could be by any number of makers. They have a Swedish or Bohemian look to them. Please note these glasses are now SOLD! This brings back memories!! 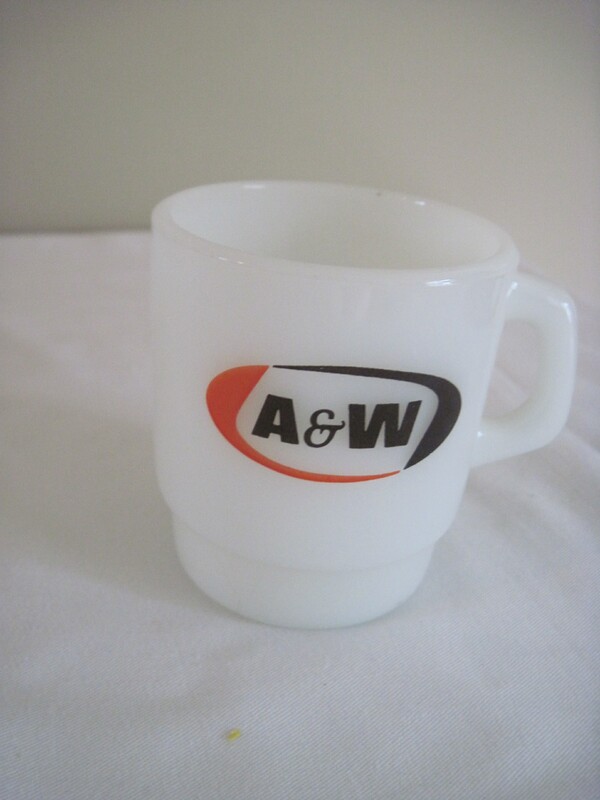 I worked at A & W back in the mid 1960’s as a teenager. 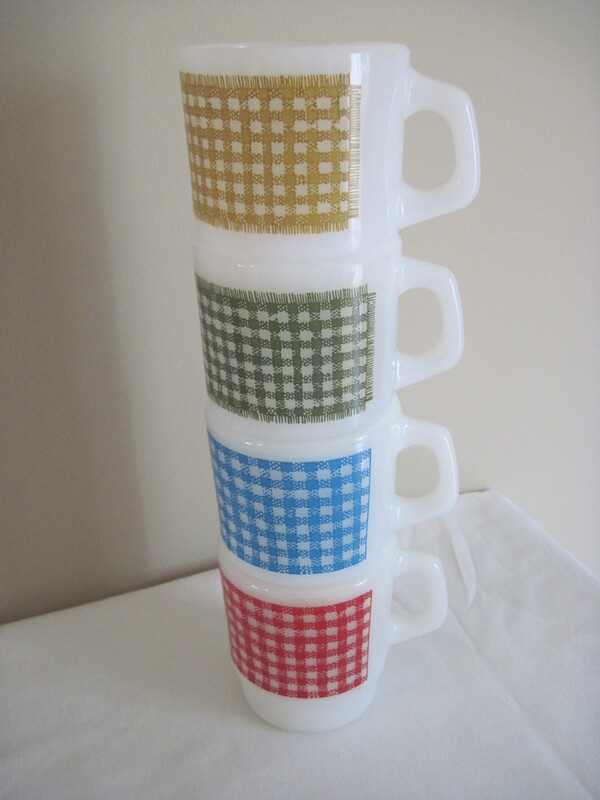 This is a milk glass stackable mug by Anchor Hocking, the same company that made FireKing items. 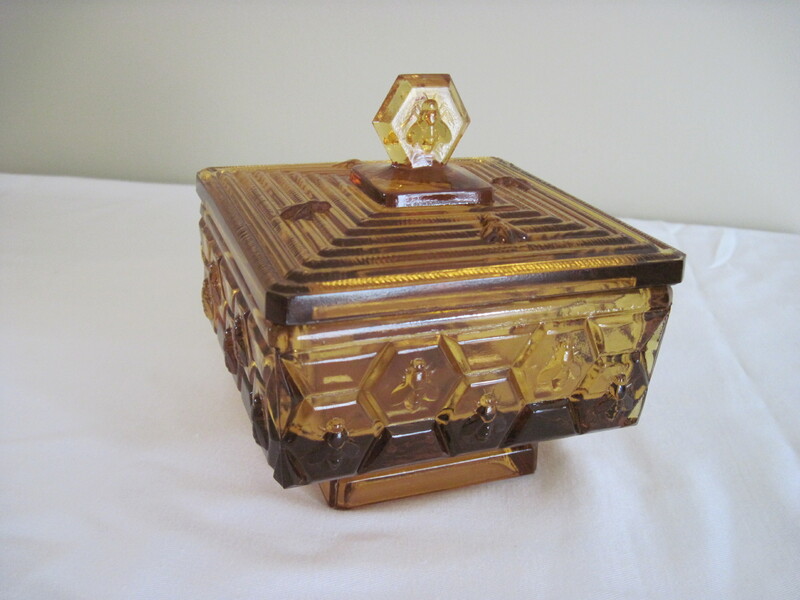 This lovely little Fenton glass container is adorned with honey bees along the sides and lid. It recently SOLD at an Antiques show we participated in. It is quite heavy and measures about 4 1/2″ square and 4 1/2″ high and has a pedestal base. “Honeycomb Bee”, was originally designed for a beekeeper in the midwest in the 1940’s; and Fenton only used this pattern for a short time.